Diabetes in pregnancy may negatively affect the developing fetus, neonate, and child. Poorly controlled maternal hyperglycemia before conception and during the first trimester is associated with an increased rate of major birth defects and spontaneous abortion. Cardiovascular defects represent the most prominent congenital malformations associated with diabetic pregnancy. The most frequently reported cardiac malformations in clinical studies include atrioventricular septal defects, hypoplastic left heart syndrome and persistent truncus arterious. Although surgically correctable, these cardiac malformations substantially increase the risk for complications and cardiovascular disease later in life. Even without heart abnormalities, the risk for diabetes and cardiovascular disease is elevated in children and adults who have been exposed to adverse intrauterine conditions, a phenomenon known as fetal or developmental programming. However, the genetic factors by which maternal diabetes affect embryonic and fetal development, as well as the progression of metabolic diseases, remains unclear. Maternal diabetes may affect the developing embryos and trigger diabetic embryopathy. The external appearances of embryos from non-diabetic pregnancies (A) and embryos with diabetic embryopathy (B) are compared. (C) The section of the diabetes-exposed embryonic heart shows an increased expression of vascular endothelial growth factor α (VEGF-A, light green). Epicardial marker, Wilm‘s tumour gene 1 (red), and nuclei (blue).are shown. Increased VEGF-A may alter morphogenic processes in the heart resulting in diabetic embryopathy. We hypothesize that the diabetic environment de-regulates specific genetic programs in the embryonic heart, thereby affecting crucial developmental processes and increasing susceptibility to cardiovascular abnormalities. The mouse model is an ideal model to use for diabetic embryopathy research because it has the same kind of heart malformations that are associated with diabetic pregnancies in humans. Using mouse model, we determined that cardiovascular defects were the most frequent type of defects in the diabetes-exposed embryos. The diabetic environment also altered the growth of embryos and their relative heart-to-body ration. Based on our global gene expression profiling data, we selected 11 genes to analyze expression changes after exposure to maternal diabetes in the developing heart. Gene expression levels were compared for different embryonic ages from the end of the first trimester until the birth. For the first time, we identified specific developmental stages that are significantly affected by the diabetic environment. Maternal diabetes altered the cardiac expression profile in the developing embryonic heart. Gene expression changes correlated with the remodeling phase of the expansion of myocardium and the formation of septum, one of key events in the heart development. The expression patterns of vascular endothelial growth factor A (Vegfa), hypoxia inducible factor 1 alpha (Hif1a), platelet derived growth factor receptor alpha (Pdgfra), and transforming growth factor beta receptor 1 (Tgfbr1) were significantly affected by maternal diabetes in the heart. Since TGF, HIF1, VEGF, and PDGF pathways are key signaling pathways in heart formation, any errors in these signaling pathways likely contribute to congenital heart disease or defects. By way of extrapolation, we postulate that the altered expression of these molecules might affect heart morphogenic and maturation processes, depending on the developmental timing of the environmental insults and thus, the final outcome of diabetic pregnancies. 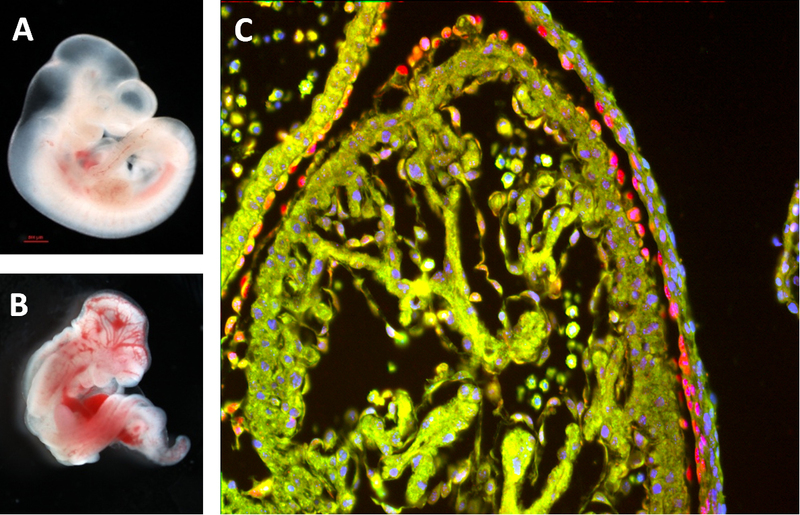 Gene expression profiling of changes induced by maternal diabetes in the embryonic heart.